Drama. Intrigue. Heartbreak. And memorable historical events. All of these elements are what make up a great entry into the genre of historical fiction. And you’ll find all of them, and more, in The Thornbearer by debut author Pepper D. Basham. Follow our protagonist, Ashleigh Dougall, as she tries to escape the betrayals she’s suffered, first by being left behind by her fiancé only eight months before their wedding, and then the ultimate betrayal by her father, sexual abuse. Fleeing on the Lusitania, she finds that a fellow traveler is one she knows well, her childhood friend and the best friend of her former fiancé, Sam Miller. Not pleased to discover he’s aboard at first, Ashleigh soon realizes that her feelings for Sam may be deeper than just friendship. But will he, or she for that matter, be able to look past what she’s suffered, and get over the idea that she is a “ruined woman?” Will God’s plan for Ashleigh ever include true love and a supportive partner? The Thornbearer is a wonderful book. Not afraid to discuss the ravages of familial sexual abuse and the feelings that its victims often carry with them for the rest of their lives, author Pepper D. Basham does so with a real feeling of empathy and a sensitivity that is absolutely crucial with this subject matter. Strong Christian themes underlie this story, as well as those of redemption and vindication over very difficult life situations. 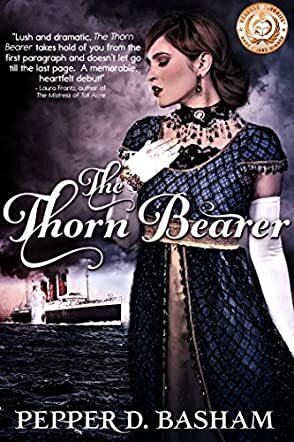 Any reader who likes Christian fiction, historical fiction, or just a great read would love The Thornbearer, and it is my pleasure to highly recommend this book. This is the first in a planned trilogy in the Penned in Time series, and I certainly hope that Pepper D. Basham is very hard at work in the next installment! Thanks so much for the fantastic review! I'm so glad you enjoyed the story!